Do you ever feel like your vote doesn’t count? That’s one reason British Columbia is currently holding a referendum on whether whether it should keep the current first-past-the-post system, which awards 100% of the power to politicians that receive a minority of votes, or switch to a modern proportional voting system – used in 80% of industrialized countries around the world, including like Germany, New Zealand and Norway – where parties win seats based on the percentage of votes they receive. Because BC’s first-past-the-post system is a “winner-take-all” system, political parties have little incentive to reflect the concerns of voters outside the core base they need to win elections, sometimes with as little as one-third of all votes. 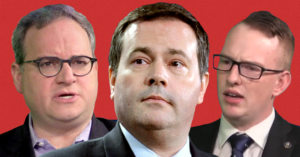 Not only is this an unfair system, but it can also exaggerate differences between urban and rural ridings, leaving the false impression that all voters in rural areas lean right while all voters in urban areas lean left. A closer look at last year’s provincial election results shows first-past-the-post leaves hundreds of thousands of voters in rural and urban voters without a voice in BC’s legislature. At first glance, northern BC may look like a BC Liberal stronghold. During the 2017 provincial election, the BC Liberals won 75% of all the seats in the region. However, the BC Liberals won only 56% of the region’s popular vote, the BC NDP won 32.8% of votes but only received 25% of the seats, while the BC Greens won 6.1% of votes and got precisely zero seats. 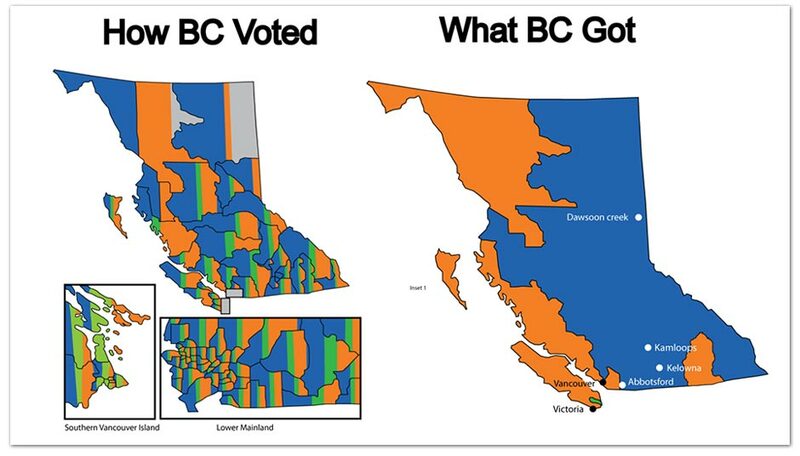 In some areas in northern towns and cities, the BC NDP actually won more votes than the BC Liberals. For example, 46% of voters in Prince George’s Spruceland area voted for the BC NDP last election while only 37% voted for the BC Liberals even though the riding is generally considered a BC Liberal stronghold. The interior is sometimes called the BC Liberals’ heartland. At the last election, the BC Liberals swept the region with a staggering 88% of seats. However, barely half of voters in the interior actually voted BC Liberal. The BC NDP won 30% of votes, but got just 12% of the seats. The BC Greens won 16.6% of votes, but, once again, did not get any seats at all. What’s more, 5 BC Liberal MLAs in this safe region won their seats with a minority of votes. While Vancouver Island is often imagined as one of the most left-leaning areas of Canada, the BC Liberals do pull out a fair number of votes, believe it or not. While 69.1% of Vancouver Island voters supported the BC NDP or BC Greens during the last election, just over one-quarter of voters backed the BC Liberals with 28.8% of the vote. Despite this, the BC Liberals only received 7.1 % of the seats. Two sitting MLAs on Vancouver Island won less than 40% of the vote in their ridings. Both Ronna-Rae Leonard (MLA for Courtney-Comox) and Sonia Furstenau (MLA for Cowichan Valley) won their seats with only 37% of the vote. Vancouver is a sad place to live if you’re a BC Liberal or BC Green voter. 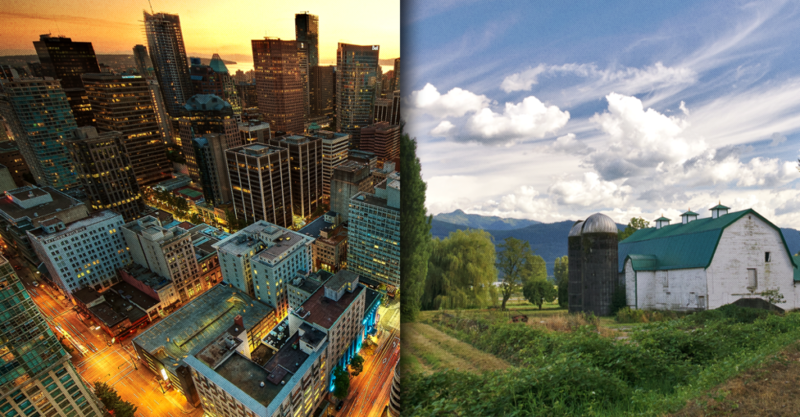 In the city, the BC NDP won 51% of votes, but command 81% of the seats. The BC Liberals won 33% of votes, but were left with a 18% of seats. And the BC Greens won 13% of the vote, but didn’t get any seats at all. Even in Vancouver, first-past-the-post leaves some voters in the dark. The BC NDP won the Vancouver-Point Grey riding with a commanding 55% majority vote, yet voters in affluent areas of the riding with luxury homes close to Burrard Inlet voted 51% in favour of the BC Liberals. Ironically, Point Grey is home to many of the wealthy British Columbians who are bankrolling the campaign against electoral reform. Correction: An earlier version of this story post mistakenly stated the BC Liberals received 21.4% of all seats on Vancouver Island. In fact, the BC Liberals received 7.1% of all seats on Vancouver Island.